The Virgin River has helped to create several impressive Southwestern landscapes, starting with the great white cliffs and canyons of Utah's Zion National Park and ending at the upper end of Lake Mead in Nevada, where it eventually meets the Colorado River. In between, the river flows across the northwestern tip of Arizona for 30 miles, through two gaunt ranges of hills - the Virgin and Beaver Dam mountains, which have similar, Grand Canyon-like scenery of eroded, stepped cliffs and terraces of metamorphosed sandstone. 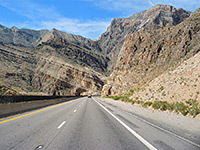 The Virgin Mountains are the more extensive and isolated range, running alongside the river as far as the north edge of Lake Mead, and forming the southwest edge of the Colorado Plateau; to the west stretch the flat, arid plains of the Mojave Desert, terrain that extends for hundreds of miles across Nevada and California. 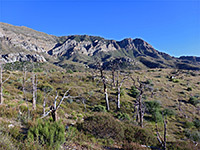 The Beaver Dam Mountains are a little more accessible but just as rugged and scenic, and part is a designated wilderness area - an untamed region of Joshua trees and cacti, lizards and mountain sheep, and much colorful, weathered rock. The Virgin River has carved a great gorge between the two mountain ranges through a region that was undisturbed and almost impenetrable until the construction of Interstate 15 in 1975, a busy highway which now runs right along the valley floor, its twin carriageways curving through the canyon over a succession of high bridges and quite a steep gradient. The river below may be nearly dry in midsummer but usually has some flow, and despite the proximity of I-15, the gorge is still quite spectacular and worth exploring on foot for a while. In spring when the river is fed by melting snow, the waters are high enough to allow raft trips through the canyon, and these are sometimes quite challenging, encountering strong currents and rapids up to Class IV. 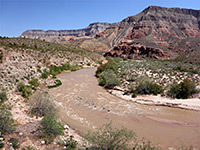 The most visited area is the BLM Virgin River Canyon Recreation Area, on the southeast side of exit 18 - this has a riverside campsite (the Cedar Pockets Campground), picnic areas and several short trails along the river. There is also one longer hiking route, Sullivan's Canyon Trail, which fords the river just west of the campground, follows the south bank for 1.7 miles then turns away up a lengthy tributary drainage. The cliffs near the recreation area are renowned for rock climbing and include some of the hardest recognised routes in the USA, rated 5.14 on the Yosemite Decimal System. Junction 18 of I-15 is also the exit for one of the few roads through the Beaver Dam Mountains (BLM 1005); a rather steep, stony and bendy track that should still be fine for any vehicle, this climbs several hundred feet to a ridge then drops down the western face of the hills into the desert beyond, joining Littlefield Road (Old Hwy 91), which before construction of the interstate was the main route north from Nevada. Now the old highway is not much travelled but provides a scenic alternative to I-15, running northeast, into Utah, and across a less rugged part of the Beaver Dam Mountains, then through the Shivwits Indian Reservation and finally southeast to St George. 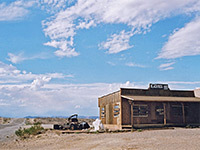 Several side tracks along the lower section of this road, west of the mountains, lead across flat plains covered by Joshua trees and cacti, to some of the best free camping sites anywhere; completely quiet and unspoilt, and with far reaching views of the hills, and south towards the distant interstate. The exit 18 road seems quite popular and also has some good places for primitive camping, most with sweeping views over the rocky terrain. Besides the varied desert plants and wildlife, the area is also geologically interesting, and specimens of various minerals can be collected such as crystalline gypsum. There are no official trails but it is easy to hike into the hills for even better views over the mountains, the Virgin River Gorge and I-15. 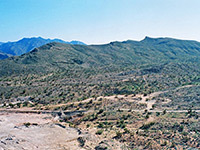 Nine miles northeast along the interstate, a short side track (Black Rock Road) begins at exit 27 and leads first to an evocative old wooden building - the only remnant of the settlement of Black Rock, Arizona - then over a small ridge to more places that make excellent free campsites, again with distant views of colorful cliffs and canyons further north. 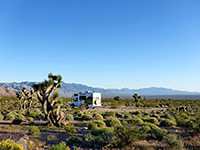 The land hereabouts is relatively flat, accessible even to large RVs, and there may be dozens of vehicles parked overnight at popular times of the year. Another route through the mountains is the unpaved, 16 mile Mojave Desert Joshua Tree Road Scenic Backway, starting and ending at junctions with Old Hwy 91 - this encounters abundant desert plants at each end, and crosses the uplands in the middle. The northern reaches of the mountains can also be seen by various other tracks off Hwy 91.